In our defense, we found ourselves in a place where no one, as far as anyone can remember, has departed from for the South Pacific. Most people leave from either Panama by way of the Galapagos, as we did last year, or from Mexico, usually around the area of La Paz and Puerto Vallarta, or from even further north, from San Diego. We carefully threaded the needle between the expected effects of the Tehuanapec north of us and the Papagayos south of us, both areas of unpredictable high winds. We threaded so well that we had no wind for the first few days and ended up motoring a full 24 hours before we could raise sail and enjoy a perfect breeze. “Stay north of the equator in the trade winds as long as possible,” our research told us. And that was our plan. But after a few glorious days of sailing we grew overconfident and headed more on the rhumb line toward our destination. 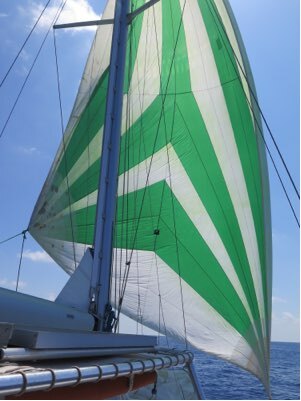 As the wind gradually dropped we adjusted sails accordingly and accepted that we won’t make our target arrival date. By Friday it was clear we had sailed right out of the wind, and the weather data we downloaded on the satellite phone confirmed we are surrounded by no wind, likely for the next three days at least. Remember the movie “Dead Calm?” That’s us. Without the psychopath. So we have between 2 and 4 kts of wind and flat seas. Our mainsail and jib are too heavy and require too much pressure to move us in such light air. But wait, we have a spinnaker that’s only been out of its bag long enough to get a good rinse before being packed away again beside the generator. It’s now or never. Sailors know that spinnakers are finicky and require adult supervision. We weren’t sure we could figure it out, or even if we have all the right parts but we hauled out the owner’s manual, systematically went though the steps and with a satisfying WHOMP! as our little breeze filled the chute, voila! We are flying a spinnaker. Sadly, it isn’t making a huge difference in our forward speed, which is hovering somewhere between 1.5 to 2 kts and we’re going to be in this pickle until probably Wednesday when the wind is predicted to start filling in again. Still, it’s a beautiful Sunday, Jack made a delicious omelet for breakfast, we learned a new skill. And that’s not bad. Every dawn we meet in the cockpit. I’m the night man so I’ll have been up since 0100 and Marce will have just gotten up from her six hour off watch so neither of us is operating at peak efficiency. Don’t get me wrong, on watch we grab catnaps in between our wakeup alarms set at fifteen minute or so intervals, just to have a look around, but there’s nothing like getting a large chunk of continuous sleep. So as I was saying our energy profiles are heading in different directions when we meet. Marce is facing a heavy load of the morning SSB nets, position reports, sending and receiving email and I’m sure I don’t know what all else. All I’m interested in is eating a little breakfast and getting some sleep, but I’ll stay up until she’s finished with her work load. Of course we pass on wind and sea state information and any concerns we have, chief among those concerns these days is where to cross the ITCZ. Our understanding is that there’s more wind five or six degrees above the equator than below so we’re staying above the ITCZ longer than we anticipated. You know the ITCZ is that squally band of doldrums near the equator where, in days gone past, mariners used to have to dump their horses overboard because they drink too much water while stuck waiting for some wind. Sometimes one forgets what a miracle our reverse osmosis water maker is and our reconstructed water maker is doing very well. Yr. humbl. obdnt. Skpr. works where his talents lay. Lately the mood of the Pacific has moderated and it couldn’t have come too soon. Gone are the twenty five kt winds and all those nasty nine foot, closely spaced, breaking lumps marching down on us out of north east. It’s been a real revelation to find that with the new rig we can get meaningful speed out of Escape Velocity in less than ten knots of breeze, which is all we have now, and we’re facing the doldrums of the ITCZ. Thank you, Colin Mack and the crew at Mack Sails for a job well done. So it looks like you name your poison, too much wind and waves or a light breeze and relatively flat seas. I wonder if something in-between is possible?